Computed tomography (CT) is the most modern method of x-ray examination. This survey allows you to perform a whole series of x-rays of the patient’s body, after computer processing which you can get a detailed flat or three-dimensional image of the internal organs. If CT is harmful to health – this question is raised by patients when there is a need for rapid and detailed diagnosis of the internal organs after an accident or sudden ill health. This fear of patients is understandable. First, in connection with the disease they have weak immune system and health. Secondly, patients know that there are many different methods of research and diagnostics, such as ultrasonography (us), magnetic resonance imaging (MRI), fluoroscopy, radiography and fluoroscopy (with layer-by-layer scanning and receiving a series of image slices a few millimeters – computed tomography). Modern methods of investigation help to make an accurate diagnosis and clarify his earlier diagnoses in a short time, but have their specific disadvantages. Some equipment on the basis of these methods is completely safe, but very expensive and removed from potential patients, some has a number of contraindications to the appointment, and some is harmful and even dangerous, if used incorrectly, the health of the patient. Computed tomography refers to radiological methods of examination of patients, such as radiography, fluoroscopy and mammography, and is based on the properties of ionizing radiation. Computed tomography is performed on devices of different modification, having the form of a streamlined and convex rings, resembling a flying space object. Also, the scanner includes a pull-out table, which performs a smooth flow of the studied patient into the device for the passage of the patient through the whole system, including the ionizing emitter and a receiver of such radiation. With the passage of a person through the CT scanner is the transmission of ionizing radiation through the patient’s body, the absorption of radiation by tissue, with the subsequent capture of rays by multiple sensors. 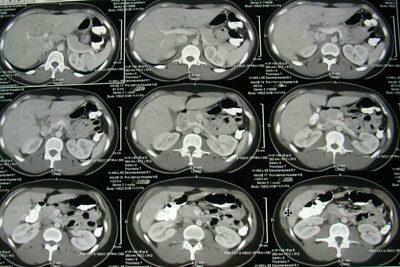 That is, a so-called x-ray of internal organs of the patient. After receiving the stream of ionizing rays, the sensor system sends information about the state of internal organs on the computer with images on the display of the diagnostic apparatus. The scanning of the patient’s body is performed in layers, a few millimeters, depending on the selected parameters. This allows to use computer programs like flat detailed images of organs, areas of the musculoskeletal apparatus and the three-dimensional image after computer processing of images-slices. With the development of medical industry developed more advanced equipment, which allows the examination of the patient in minutes with minimal health effects. Detailed graphic image of the whole body of the patient can increase or reduce in scale, explored in digital or paper form. This method of examination doctors prescribe to confirm, and sometimes Refine the previously set diagnoses, conducting interim controls of treatment and diagnosis of possible pathologies in the early stages of development. Computed tomography for recovery of health is one of the progressive methods of examination of patients. This method is an innovative radiographic method of diagnosing human diseases. This method of examination differs from a conventional x-ray the fact that during scanning the patient is not one picture but a whole Daisy-chain of images in the form of lamellar sections of the body of the patient. The images acquired after computer processing can be studied as in the monitor device, and on paper. The pictures are flat and three-dimensional images of internal organs. If it is not possible to conduct a survey of the body including harmless methods, such as ultrasound or MRI, the doctors resort to breaching CT. But we must remember that the principle of CT is based on ionizing radiation, which in high doses can have harmful effects on the human body. The staff warns about the presence of a panic button intended to stop research body. To facilitate the completion of this procedure, when the patient is scanned via the camera, experts may not put pillows under the patient’s head. The flow of fresh air directed to the patient by means of an auxiliary fan that helps to distract the human subject. When scanning the patient it is advisable to lay on your stomach. Possible doctor sends the patient for an examination using the apparatus of open type. In the examination of young patients or patients with severe claustrophobia, medical staff before the procedure I propose to take the drugs sedative effect. During the examination by computer tomography, the patient receives a radiation of 3 to 10 mSv. The radiation dose depends on the size of the study area, the selected mode of operation of the apparatus, that is, the number of pictures in the layered cut and, of course, to age and modifications of the imager. Scientists estimate that, on average, one treatment on the computer tomograph corresponds to the background radiation received by a person in over 2 years of everyday life. The radiation tends to accumulate in the body. Experts have also determined the maximum annual dose human exposure 150 mSv. However, cancer can appear and grow already at the dose of 50 mSv. 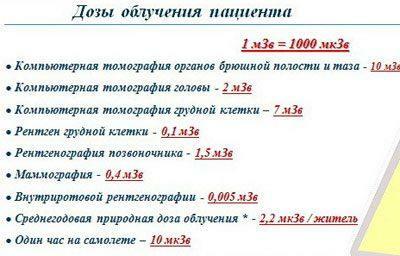 Therefore, doctors recommend not to exceed a radiation dose of 50 mSv. 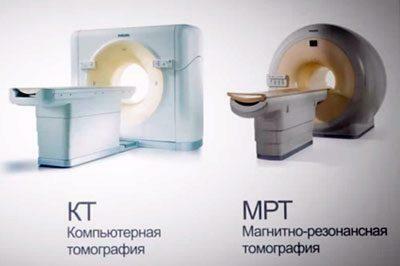 The CT harm to the human body are obvious, but with the development of modern medical technology, it can be minimized. It is important to adhere to certain rules. In order to answer the question, what is more harmful an MRI or CT scan, you need to consider the principle of construction and work vehicles such methods of examination. During examination of the patient with computed tomography the organism is exposed to low doses of ionizing radiation. With repeated use, the radiation accumulates, so it has some limitations and contraindications. For example, the survey in this way is forbidden for pregnant women. 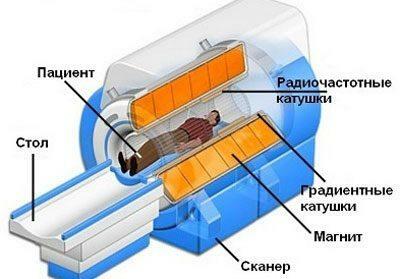 In the diagnostic apparatus on the basis of MRI, the radiation sources are absent, and the patient under examination undergoes only a strong, but completely safe electromagnetic field. Therefore, such apparatus can, without limitation, to undergo repeated examination.